My parents are my heroes because they are the two people that I look up to the most. Both my mom and dad are patient, understanding, and loving. I have two brothers and one sister and they treat all of us kindly and with respect. I am amazed at how much they do for the whole family. I hope to be like my parents in the future. My little brother is a hero to me because he is so strong. He struggles with Crohn's disease and is constantly missing school for hospital stays and doctor's appointments, yet he still maintains high grades. My brother never complains about his disease and still has lots of friends, plays sports, and has fun. I look up to him for his strength and positive attitude. 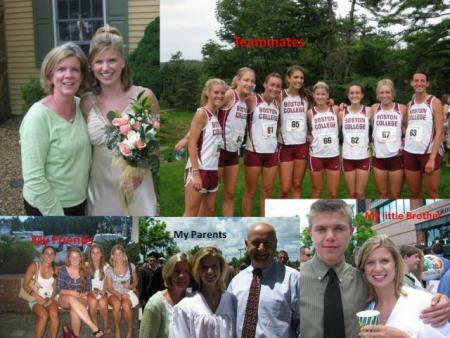 I am on the cross country and track team at Boston College. My teammates are my heroes because they keep me motivated at practice. They are encouraging and supportive, which makes being on the team so much fun. I have become great friends with these girls because of the happiness and love that they share. My three best friends at home, Sarah, Nicole, and Ali, are my heroes because they are the best listeners I know. They care about anything and everything that I tell them and they are a great support system. These girls can make me laugh, know me better than anyone, and are thoughtful and fun. I am so lucky to have such great friends and family members to look up to.